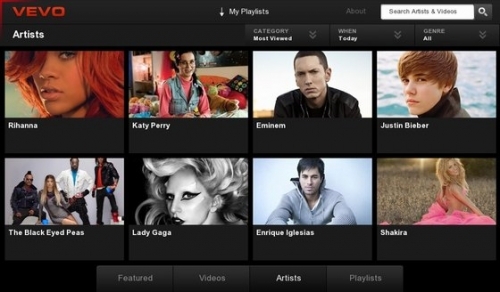 VEVO music video service for the BlackBerry PlayBook | BlackBerry Blast! The VEVO music video player is now available for the BlackBerry PlayBook. VEVO has been available for iOS and Android but now PlayBook users can enjoy the service too. VEVO also offers an extensive music video collection, along with exclusive interviews and performances from many different artists. One of the nice features of VEVO on the PlayBook is the ability to output the VEVO music videos to TV using the HDMI-out port. Download VEVO for BlackBerry PlayBook in the BlackBerry App World.